Happy New Year to all kid bloggers and their families! Just because the holiday season is finished, it doesn’t mean that all the goodies are gone. Today we have a very special recipe post from Chef Grace. Grace is from the USA and is in 4th Grade at school. Her dad is also a chef, but the recipes in her blog are all Grace’s own. Once I went on Club Penguin and I saw a game called “Pizza Patron 5000.” There was a lever you can click to switch it to “candy mode” but they called it “cookie mode.” I thought it was more like candy pizza and would make a good idea for my blog. 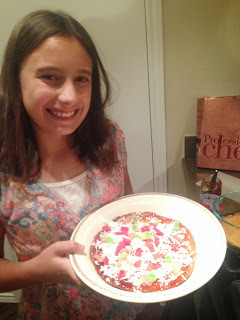 I thought that a candy pizza should have a different crust, different sauce and different toppings. Some early topping ideas I had were jelly beans for peppers (red & green), and coconut for cheese. For the crust of my candy pizza, I didn’t think it should be like a regular pizza crust. I wanted to use a pastry crust, because pastries normally have strawberry or chocolate icing on them, and sometimes candies. I used a Pate a Choux recipe from my Daddy’s chef cookbook. This is the crust for eclairs, which are made in France a lot. I chose this because I really like French things. I didn’t make the whole recipe because it would have been way more than we needed. I only wanted to make a few candy pizzas, so my dad helped me divide the amount of each ingredient by three, so we made one third of the recipe (1/3). Daddy taught me about pounds, ounces, teaspoons and cups and things to measure in. To make the recipe, you should meet with your mom or dad and work out the numbers to make the recipe smaller so you don’t have a whoooole lot of candy pizzas or one ginormous pizza. Don’t worry, it’s supposed to get really thick! I didn’t want my sauce to be tomato sauce. It needed to be something sweet, like strawberries. I used cranberry sauce and pumpkin butter, because I thought they would go with the holidays. I also tried the raspberry jelly, but not the yogurt or Daddy’s raspberry sauce, because it had peppers in it! Gross! I liked the pumpkin butter the best. It tasted like it had cinnamon and brown sugar, and I really liked that! (I really like pumpkin pie too.) I used shredded coconut for cheese, because it was white and looked like cheese! My sister Selah helped with the toppings. She was happy to finally help, because we kicked her out of the kitchen earlier during all the hustle and bustle of making the pizzas. And check back here soon for our roundup of the top kid food bloggers – leave a link in the comments section if you’re a young food blogger who’d like to be included. Love to see kids cooking! If you’re looking for more easy meals that kids love, check out my book on Amazon Kindle: Kid Approved Slow Cooker Meals. http://tinyurl.com/lg8qx4n Very few ingredients and very yummy.